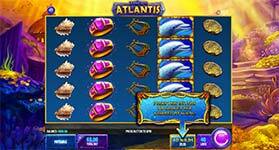 Explore the depths of of the ocean for lost cities and forgotten treasures in King of Atlantis slot machine by IGT! Join Poseidon, God of the Sea, on an exciting 40-line journey across 5-reels and 5-rows of action. Feel the intensity increase when Gigantic Wilds make an appearance on the reels leading to enormous wins. Gigantic Wilds – The Wild symbol is Poseidon and appears two reels wide. It can substitute for all symbols in the game except the bonus symbol to complete wins. Free Spins – Land the Bonus symbol on reel 1 of the base game alongside a Poseidon wild to win free spins! You’ll start with 8 free spins where the reel positions with wild symbols that trigger the round stay wild for the entire bonus feature! Increased Wilds – You can change the number of gigantic wilds that appear on the reels at any time by increasing your bet amount. Choose to have either 20, 40 or 60 wilds added to the reel strips!